Artificial habitats have been used for centuries to successfully modify environments for the benefit of Man. In the aquatic environment, the use of artificial habitat technologies is of growing interest worldwide. Opportunities exist in both developed and developing nations to apply these technologies in many areas, including classical scientific investigations of ecosystem structure and function, engineering advances in underwater technology, and fisheries and environmental management. The applications of artificial habitat technologies are taking on ever greater economic, social, and environmental importance globally, not only in developed countries such as Japan where highly sophisticated technologies are used, but also in developing nations, where lower cost practices are in use. There is growing pressure to increase production, while at the same time preserve or enhance the environments and ecosystems surrounding fisheries. This book provides a comprehensive review of the facts, issues, and global trends emerging regarding the use of artificial habitats in aquatic ecosystems. It presents the most recent scientific advances in ecology and engineering technologies related to the building of artificial habitats, and it also presents many of the fisheries management and socioeconomic and environmental issues. 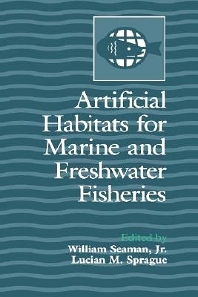 Artificial Habitats for Marine and Freshwater Fisheries will be of interest to a broad audience including natural resource scientists, planners, and managers, particularly those interested in aquatic and fisheries science and management; organizations and individuals interested in commercial and recreational fishing; ecologists; environmental economists, engineers, lawyers, and social scientists; and geographers. W. Seaman, Jr. and L.M. Sprague, Artificial Habitat Practices in Aquatic Systems. R.B. Stone, J.M. McGurrin, L.M. Sprague, and W. Seaman, Jr., Artificial Habitats of the World: Synopsis and Major Trends. J.A. Bohnsack, D.L. Johnson, and R.F. Ambrose, Ecology of Artificial Reef Habitats and Fishes. R.S. Grove, C.J. Sonu, and M. Nakamura, Design and Engineering of Manufactured Habitats for Fisheries Enhancement. J.J. Polovina, Fisheries Applications and Biological Impacts of Artificial Habitats. S.A. Bortone and J.J. Kimmel, Environmental Assessment and Monitoring of Artificial Habitats. J.W. Milon, Social and Economic Evaluation of Artificial Aquatic Habitat. Each chapter includes references. Index.